The winner of the latest Great Monday Give mentioned this in a comment today, so I thought I'd pull it off the shelf and do a write up. Published as part of The Nutshell Library (along with One was Johnny, Alligators All Around, and my personal favorite... Chicken Soup with Rice), Pierre is indeed a cautionary tale. I will give wee Pierre the nickname I use on my son sometimes... Captain Fussypants. When Pierre doesn't give a hoot about just about everything and fills his parents earlobes with the insufferable mantra "I DON'T CARE", a rather large lion comes along to set him straight. if he'd like to die. This whole series is so killer and will probably stay in print for eternity -- available at fine bookshops most anywhere. I also recently revisited this NPR interview with the author from 2005. He has had such a fascinating life, and hearing him talk about Ruth Krauss makes me long for a mentor of my own. 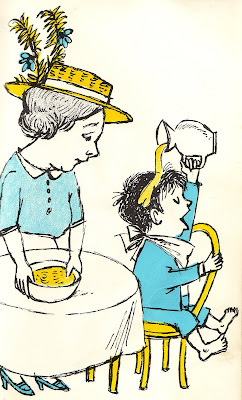 Plus, who knew Sendak is such a Mickey Mouse-of-old fan? The story behind that love affair is inspiring... and I just about died when he calls the Mickey of today a "fat whore". AWESOME. My class and I watched the Scholastic video of this a few weeks ago and I loved it! Thanks for the info! I love this site! Love this one! I had totally forgotten about it. My little sister and I used to listen to this story on tape over and over when we were kids. He has such lasting stories! THIS is one of my favorite books (I posted about it a few months ago). I teach a bunch of three year olds once a week for two hours and they always request this book. Yes, I care. Current (and very well done) analysis of this book and Sendak by the New York Review of Books; written after the passing of Mr. Sendak.